An undercover video has revealed dairy workers using hot irons on calves without anesthetic - with one saying it's more 'fun and exciting' to see the animals in pain. The footage, filmed at Heifer Solutions in Wisconsin in December by vegan charity PETA, shows the men using hot irons to 'debud' the animals - i.e burn tissue off their heads to stop horns from growing. The video shows the animals kicking and crying out in pain, as smoke rise from their charred flesh. According to PETA, the third-degree burns that are incurred can cause pain for weeks. "The worker said that providing the calves with local anesthetics before burning them would make the disbudding 'a lot easier, but where's the fun in that?'" said PETA. "He even said that keeping the hot iron pressed against the calves' heads as they jumped around and kicked made the process 'more exciting' to him." 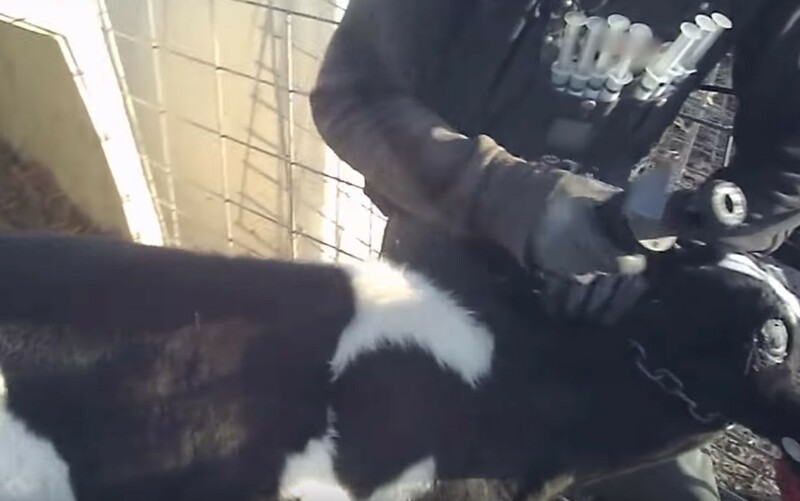 "The calves in these scenes struggle violently...in a manner indicative of extreme distress, pain, and suffering," said a veterinarian who reviewed the footage. In my professional opinion, disbudding a calf without adequate anesthesia or pain relief is cruel and causes unnecessary and excessive pain and suffering." Heifer Solutions says it has now suspended the worker in the video.